Blissology: Holiday Fair I - Successful Completion! Holiday Fair I - Successful Completion! Today was our Holiday Bazaar hosted by our local school Booster Club. We really didn't know what to expect. It was our first time doing this one, and it's only the second year of the fair. We did go shopping there last year and it didn't seem like there were many people there. But it was $25 for a table and we didn't have any reason not to go. I'm not sure how the other vendors did, but we did very well. We sold TONS of soap. We even ran out of a few kinds. There wasn't very many people, as we expected, but those that were there were there to buy. At least they did from us. 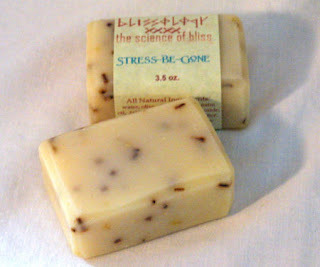 If there was any clear best-seller today, it was Stress-Be-Gone Soap. We sold every bar we took and probably would have sold more if we would have had more. It has an essential oil blend of sweet orange, peppermint, spearmint, eucalyptus, rosemary, and lavender. I think people always need stress relief products, but especially during the holidays. To make this bar extra awesome we also added lavender buds and calendula flower petals. It is GOOD STUFF and today's sales reflected that. We also lined up a large wholesale/consignment with a new day spa. They'll be using our massage oils, scrubs, lotions, and pretty much everything else they possibly can. When we unveil our shampoo after the new year (shhh! that's still a secret!) then they'll be using that as well. Plus, they'll have our full line available for sale too. 0 Responses to "Holiday Fair I - Successful Completion!"